The latest trend toward fossil fuels is dangerous for the entire planet, since China is the world’s largest emitter of greenhouse gases. Signaling China’s ambition to be the world’s leader in solar energy, Beijing officials announced in January that the country had installed an impressive seven gigawatts of solar power capacity in 2012 and would add an additional ten gigawatts this year. The bold announcement is consistent with the “Green Leap Forward,” China’s goal to assert global leadership in renewable energy and low-carbon development. At the United Nations Climate Change Conference in Copenhagen three years ago, Wu Changhua, China director of the London-based Climate Group, galvanized an auditorium of environmentalists by stating that low-carbon growth had become “mainstream” in China. No longer a fringe industry, clean energy would be transformed into a robust market, with mass-scale production enabling global distribution and bringing downward pressure on prices everywhere. China would become a cornucopia of state-of-the-art, cheap and abundant green technology, all flowing from the enlightened thinking of its centrally planned economy and ambitious energy-savings targets. But by the end of 2012, even the most optimistic surveys of China’s energy mix showed that low-carbon growth is still nowhere near mainstream. In fact, the clean-tech industry is encountering major obstacles, with government officials admitting to “broad operational difficulties” regarding the latest solar power expansion. 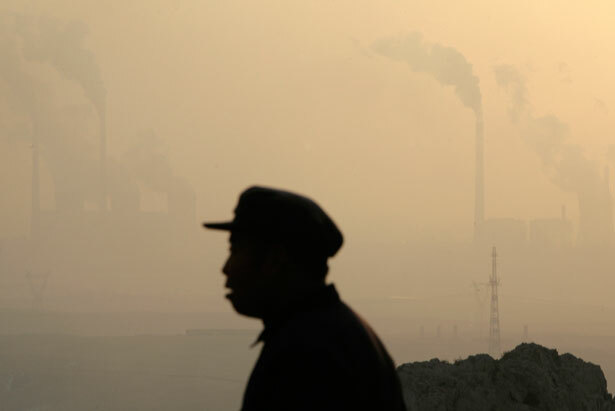 For many Beijingers, it is difficult to maintain enthusiasm for China’s so-called leadership in low-carbon growth when the city’s air is rapidly deteriorating. A mid-January reading from the US embassy showed the Air Quality Index at a shocking 728—on a scale of 1 to 500, with 200 considered a serious health risk. Three recent developments have shifted China’s tack toward a more fossil-fuel-centered approach and away from the low-carbon model the country pursued under outgoing president Hu Jintao. This trend is dangerous for the entire planet, since China is also the world’s largest emitter of greenhouse gases and will soon have the world’s largest economy. First, the inauguration of pro-market president Xi Jinping marks a shift away from the conservation-oriented, government-planned approach of his predecessor toward a model marked by increased privatization, including tax cuts for private enterprises, relaxed political controls, programs to boost domestic consumption and intensified resource exploitation. Xi insists that low-carbon growth will remain a priority and that the ambitious energy-saving targets of the twelfth Five Year Plan, issued in March 2011, will be met. But the targets were written in such a way that many of the details for implementation are open to interpretation. While the government had previously signaled that it would rely on growth in wind and solar to meet its goal (11.4 percent of total energy from renewable sources by 2015), it now looks like the bulk of that will come from nuclear and hydroelectric. Wind and solar are growing, but as a proportion of China’s total energy expenditure, coal is growing much faster. Second, shifts in US energy consumption patterns, as well as changes in estimates of global oil reserves, will affect China’s long-term energy strategy. The International Energy Agency reports that discoveries of shale gas combined with new drilling technologies will make the United States the world’s largest oil producer by 2020. This is expected to make oil reserves in the Middle East and Central Asia newly available to China—which could reverse the shortage-driven incentive structure that promoted growth in China’s renewable energy sector. At the same time, China discovered that it may have the largest shale gas reserves in the world. A Chinese shale gas boom, coupled with increased output from coal and imported oil, could marginalize wind and solar energy. Moreover, with Washington now looking to shale gas rather than wind and solar for new energy resources, prospects for increased US consumption of China’s green exports are diminished. Third, consumption patterns have eroded one of China’s most promising areas for low-carbon development: electric vehicles. A recent McKinsey & Co. report ranked China’s EV market a dismal fifth behind Japan, the United States, France and Germany. Even with generous subsidies for consumers and manufacturers, EV sales are sluggish, accounting for less than 0.02 percent of total vehicles sold (in the United States, it’s 0.09 percent). Demand is growing for gas-guzzling SUVs as well as luxury and medium-weight vehicles, especially foreign models, with imports of foreign-manufactured cars nearly doubling in 2010. The top-selling car in 2011 was the Buick Excelle, followed by the Volkswagen Lavida and the Chevrolet Cruze. China’s domestic vehicle manufacturers are drastically scaling back their small, fuel-efficient models and EV fleets and attempting to regroup around the new high-carbon model. In fact, China’s EV manufacturers are turning away from personal cars altogether and focusing on hybrid and electric city buses and taxi cabs. The major buyers of EVs are local governments and large state-owned corporations, not individuals. Furthermore, without reform of the energy grid, EVs will do little to reduce greenhouse gas emissions. My colleagues and I at the Innovation Center for Energy and Transportation recently completed a study of China’s EV industry in which we discovered that, on average, EVs produce more greenhouse gas emissions per kilometer than their traditional internal-combustion counterparts. That’s because EVs draw energy from electricity grids, some of which rely on coal—the dirtiest of fossil fuels—for up to 98 percent of generation. Only in regions where the grid depends on nuclear and hydro energy did the EV reduce its carbon footprint. Foreign-manufactured autos have so far been excluded from China’s fuel-economy standards, which are stricter than those in the United States. Currently, China imposes a tariff on foreign-manufactured cars, which has helped Beijing enforce its fuel-economy standards. But the Obama administration is petitioning the World Trade Organization to force China to drop tariffs on imports. If Obama’s bid is successful, an increasingly smaller share of China’s auto market (now the largest in the world) will be subject to strict efficiency regulations. To be fair, many of the connectivity and technical problems will likely improve with time. Greenpeace’s China Wind Power Outlook 2012 shows that some of the technical challenges have already been resolved since the earlier reports. And again, market conditions are not the only factor at play: China has its own peculiar outlook on green energy. According to Ma, “China’s development of solar and wind is not just for energy purposes. They are aiming to become the global leader of this so-called boom of clean technology. The government is trying to make ‘Made in China’ clean-tech equipment and products dominant” in the global marketplace. Ma thus predicts that China’s wind and solar industry will continue to grow. But that doesn’t necessarily translate into increased installed capacity: most Chinese-made clean technology is exported abroad. The news is not all bleak, though. Popular demand for fuel-inefficient cars may be growing, but there is also growing protest and civil unrest—both spontaneous and planned—against pollution and environmental problems. In October 2012, protesters in Ningbo, Zhejiang Province, clashed repeatedly with police until the government promised to halt plans for the construction of a petrochemical plant. Through petitions and demonstrations, villagers in Qiugang, Anhui Province, shut down a chemical factory that was polluting waterways and raising cancer risks. Even without popular elections, Xi Jinping’s government will have to take seriously this new power of the people if it hopes to remain viable. Rebecca Solnit outlines why “2013 Is Year Zero for Climate Change” (Dec. 26, originally on TomDispatch.com).